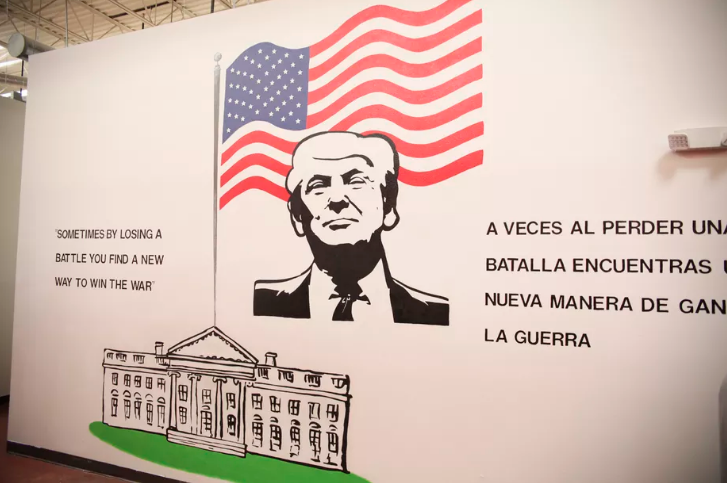 A mural on the wall inside Casa Padre, the largest government-contracted migrant youth shelter, located in Brownsville, Texas. Amidst reports of child detention centers providing inadequate housing conditions and being responsible for sexual abuse and psychological trauma inflicted onto children, the federal government’s family separation policy is under more scrutiny than ever. America’s Voice Ohio organized a conference call with a group of legal experts to put the Trump administration’s response to mass migration into context and explain possible alternatives to detaining families at the southern U.S. border. Brian Hoffman is a pro bono coordinator at the International Institute of Akron. He said he has been working with migrant and refugee families at the border for years and be believes there are misconceptions about these immigration policies. Many Americans think the family separation policy is new or that it was initiated by this administration, which isn’t true. This situation has been present for a long time, and Hoffman said that the horrific situation we find ourselves in with children being abused in detention centers was very predictable to himself and his colleagues. He explained that in 2009, President George W. Bush ended family detention in the U.S. In 2014, President Obama restarted this practice. The government turned part of the Federal Law Enforcement Training Center in Artesia, New Mexico, into a family detention center. Hoffman said he volunteered there and witnessed the beginnings of abusive enforcement practices that are now taking place across the country. That same year, he said the government attorney suggested that families could be separated to comply with the restrictions on the amount of time that they are legally allowed to keep children in detention. Maureen DeVito, a volunteer attorney who recently visited a federal family detention center in Dilley, Texas, said that the federal government’s current system sometimes gives immigrants no choice but to cross the border illegally. She said it’s important to understand that these families are fleeing for their lives. She has witnessed mothers with their children who waited at the Port of Entry for hours in the 100+ degree heat, only to be turned away by the agents. They came back day after day and kept getting refused, and they were sleeping in the streets of Mexico during this time. So eventually, their only other option was to cross the border illegally. In the detention center in Dilley, DeVito said for three days the children only received three cookies and some juice for breakfast, lunch and dinner. The agents housed them in cages, with about 50 in there at one time. They had only a mattress on the floor to lay on. Katharina Obser, a senior policy advisor for the Women’s Refugee Commission, said that she and her colleagues believe that there is no humane way to detain families. “This is a practice that has been widely opposed not only by groups like the American Academy of Pediatrics, but also by DHS’ own advisory committee,” she said. She offered an alternative strategy that the federal government could use to effectively respond to mass migration at the southern U.S. border. The Family Case Management Program existed from January 2016 through June 2017 in five U.S. cities. Obser said that under this program, families would still go through removal proceedings and asylum case hearings, but the program matched families with a case manager who made sure they had access to social, medical and legal services. The families could be released while going through their cases, which means that the program would cost just a fraction of what detention costs. When it was in effect, the Family Case Management Program costed $38 per family per day, compared to $320 per day for just a single bed in family detention. The program also had a nearly 100 percent compliance rate. “There is another way to treat families who are seeking protection here that ensures due process, that ensures justice and that doesn’t separate or detain them,” Obser said. She added that the Trump administration has refused to restart this program, despite the positive results it created.